RAMPS has had another busy year supporting struggles against extraction across the country and keeping the pressure on the companies and politicians perpetuating mountaintop removal in Appalachia. 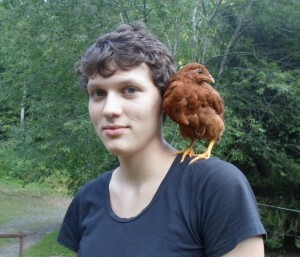 With resistence to extraction spreading like wildfire and the movement in Appalachia digging in, the work shows no sign of slowing down in 2014 and RAMPS has no plans to slow down either. Won’t you consider making a donation today to ensure we can continue our critical work? Small groups taking direct action on the frontlines like ours don’t get money from big foundations or donors like Michael Bloomburg. We depend totally on passionate, committed people like you giving what they can. We know a lot of big groups are asking for your money right now, and we hope that you’ll considering giving to RAMPS where your donations can make a huge difference for us. Read our year in review below and we hope you’ll be as inspired as we are by the resistence across the country. This was a big summer for this movement, and RAMPS was a big part of it. With allies across the county, we launched “Fearless Summer”, an open-ended callout for folks fighting extreme energy across the country to take united and escalated action. Many answered the call, with dozens of groups from Sierra Club Chapters to Earth First! endorsing the callout and taking actions resulting in hundreds of arrests. From folks in Maine blockading train carrying frack oil to folks in Detriot turning back pet coke trucks to Montanans rallying against coal exports, the movement was in action across the country. By embracing a common framework and united front, we showed that we are one movement, bigger and stronger than each of our campaigns alone, getting our message of unified resistence into the San Francisco Chronicle and YES! Magazine. The summer was such a big success that weinspired our comrades out in Australia to launch their own Fearless Summer in the depths of our winter. This inspiring show of power was cooked up by organizers at the first Extreme Energy Extraction Summit, a meeting of a wide spectrum of groups across the anti-extraction movement to strategize together, strengthen each other’s approaches, and broadcast a common message about the social and environmental costs of resource extraction and climate change. We are excited to be a part of these ongoing meetings. We believe deeply that our struggle against MTR is one and the same as struggles against fracking, tar sands, uranium mining and others and that we can only win our individual struggle for justice by uniting and fighting together. Four members of RAMPS were arrested with eight others on Monday for locking down in UBS’s national headquarters and for hanging a giant banner from a construction crane. Teaming up with Hands Off Appalachia, RAMPS travelled north to Stamford, CT, for HOA’s fall action camp. 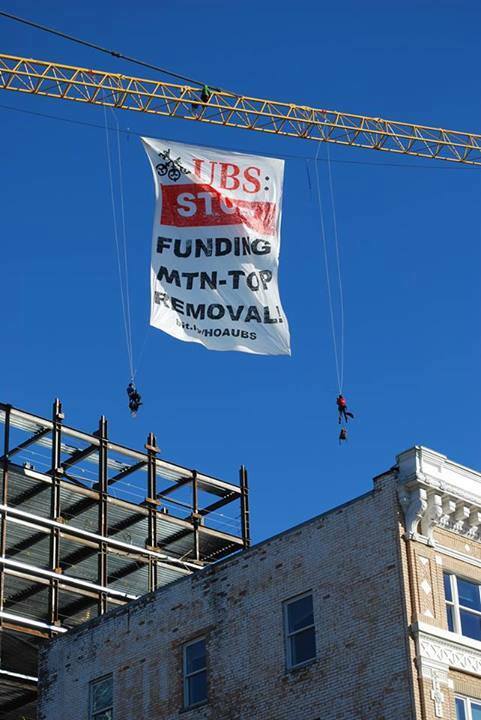 Coal companies couldn’t tear down the mountains of WV without financers like UBS backing their capitol-intensive exploits–so we would like to make sure that companies like UBS can’t fund mountaintop removal without activists decorating their national headquarters. All twelve arrestees have their first appearance in court on January 8th. More Details on this action are in the press release below. 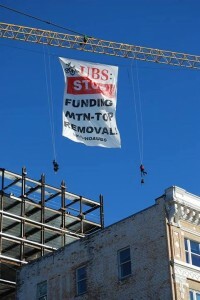 Stamford, CT – Early this morning, three activists hung a huge banner reading “UBS. Stop Funding Mountaintop Removal” off of a crane constructing the 66 Summers St building in downtown Stamford. Later in the day two activists entered the UBS headquarters in Stamford, locking themselves to a bannister and hanging a banner reading “UBS. Divest from Mountaintop Removal”, while others locked themselves to the outside doors of the building. The protests are a part of the Hands Off Appalachia, a sustained campaign to get UBS to end all financing of companies conducting mountaintop removal coal mining in Appalachia. “Over the last two years, I have visited UBS’s offices over 30 times pleading with them to stop the destruction of Appalachian communities. Today, I’m not asking anymore. I’m demanding an end to UBS’s financing of mountaintop removal.” said Ricki Draper of Knoxville, TN who is locked inside the UBS headquarters. Mountaintop removal is an extreme form of strip-mining in which coal companies blast up to a thousand feet off the top of a mountain to extract thin seams of coal. The resulting rubble is often placed in the valley below burying headwater streams. Over 1 million acres of forest in Central Appalachia have been destroyed and over 2,000 miles of streams have been buried by this practice. Recent research has linked mountaintop removal to increased rates of cancer, birth defects and cardiovascular disease in communities near these mining operations. UBS is a top funder of companies that conduct mountaintop removal such as Alpha Natural Resources, Patriot Coal, and Arch Coal. On Friday, organizers with Hands Off Appalachia met with UBS executives at their office in Stamford to discuss UBS’s existing policy on mountaintop removal. “[At the meeting] I was ‘reassured’ [by UBS executives] that UBS’s policy on mountaintop removal was sufficient enough to protect my people. I wholeheartedly disagree. The reality is that their ‘policy’ is nothing more than an excuse to remove themselves from the truth that as UBS profits, my people suffer,” said Adam Hall of Glen Daniel, W.Va. who blocked the entrance to UBS’s headquarters today. UBS’s existing policy claims to “recognize the potential environmental, social, and human rights impacts of this industry sector” and take into consideration “concerns of stakeholder groups”, but UBS officials have never travelled to Appalachia to witness the impacts or met with impacted community members until last Friday. The policy also claims to take into account regulatory compliance, but UBS financed Massey Energy and oversaw their merger with Alpha Natural Resources even after Massey was fined $20 million by the EPA for over 4,600 violations of the Clean Water Act. Started in Knoxville, TN, the Hands Off Appalachia Campaign has spent two years engaging with UBS about their funding of the destruction of Appalachian through this extreme form of strip mining. HOA has organized dozens of actions and protests at local UBS offices all over Appalachia and the Southeast.